Do you still use baby talk with your preschooler? Sure, it was cute when your child was 12 months old, but your preschooler is smarter than you think! It’s time to talk to your little one honestly and genuinely. Angela C. Santomero and Deborah Reber, authors of PRESCHOOL CLUES, share why baby talking to your child over eighteen months of age is disrespectful. Preschoolers have many talents, but reading people’s intentions is one that seems to be especially fine-tuned. They know when someone’s being disingenuous, or when someone is using an overly sweet and slow tone, or when they’re being spoken to by someone who doesn’t “get” them. Think about it: why do so many people insist on raising their voice up an octave, turning down the speed dial, and pouring on the saccharine when talking with young children? The truth is, infant-directed speech or “Motherese” or “Caregiver Speak” is a language that has been used by parents since the beginning of time to get an inherent response out of babies. Infants respond to the slower speech, higher pitch, and very exaggerated pitch contours. But just as your baby grows, the language you use with them has to grow. For anyone over eighteen months of age, baby talk feels disingenuous and disrespectful. More than any other aspect of our host Steve’s connection with his young audience in Blue’s Clues, I see his honesty and genuineness as the primary reason he so successfully connects with preschoolers. And it’s a fact I’ve taken to heart in every kids’ show I’ve created. Steve in Blue’s Clues is expressive, happy, and interested. He doesn’t patronize. He doesn’t dumb down his vocabulary. And he Pauses for kids to answer him. Steve’s character was created to model respectful communication with children in a genuine and honest way so they learn in a warm, nurturing environment. Likewise, Bianca, our animated star in Wishenpoof, looks to the camera very closely and speaks to the viewer directly. She respects the home viewers by letting them into her world as she makes mistakes and tries to solve problems, one step a time. With Bianca, we’re showing another example for how to bring our kids into our thinking so we can model genuine and honest reactions and the viewers can learn how to problem solve along with us. But how can we as parents replicate this authentic communication approach to the benefit of our children? It can be a tricky balance. 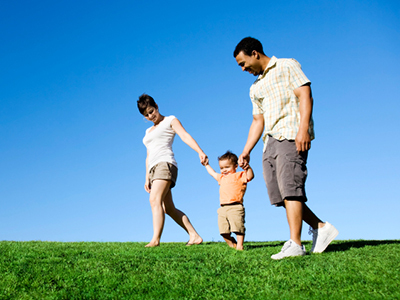 As parents, we are consistently forming a boundary around our children to protect them and to keep them safe. Yet as they grow, our boundary needs to get incrementally wider to continue to keep them safe and secure while also fostering their independence and learning. This is the power of respectful language. We know that preschoolers respond best when spoken to on their level—looking them in the eye when we speak, using appropriate language, defining language for them, as well as using slower and more directed speech, repetition, and playful rhetoric. Child development psychologist Roberta Schomburg is a huge proponent of being honest with our children. “Parents sometimes think it might be easier to just slip away without saying good-bye by telling children, ‘I’ll be right back’ or ‘I’m just going to get some coffee.’ Sometimes we make promises that we have no intention of keeping. ‘Yes, yes . . . we’ll do that tomorrow.’ These kinds of statements mislead children and, in the end, undermine their trust that adults will keep their word,” she says. Being genuine and honest also means acknowledging when we say things we didn’t mean to say or when we lose our cool because we’re stressed or frustrated. Since it’s our kids’ jobs to push our buttons— they are hardwired to test the limits with us so they can figure out who they are independent from us—our job becomes showing them how to toe the line, respectfully The key? We admit to being stressed or frustrated or angry. Telling your preschooler, “I’m feeling like I’m going to have a tantrum! I feel stressed. How can you help me?” or “I need a minute to clear my head” or even singing Daniel Tiger’s mad strategy to yourself, and then walking away to calm yourself down, is an excellent way to cut the tension and even enlist your preschooler’s help. These strategies are the very ones we want to teach our kids. And what better way to clue our kids in to our honest, genuine feelings than to show them the power of managing our emotions. The key? We admit to being stressed or frustrated or angry. Telling your preschooler, “I’m feeling like I’m going to have a tantrum! I feel stressed. How can you help me?” or “I need a minute to clear my head” or even singing Daniel Tiger’s mad strategy to yourself, and then walking away to calm yourself down, is an excellent way to cut the tension and even enlist your preschooler’s help. These strategies are the very ones we want to teach our kids. And what better way to clue our kids in to our honest, genuine feelings than to show them the power of managing our emotions. Never underestimate the value of our kids knowing that we make mistakes, too. It’s powerful for a preschooler to understand that adults are human, that things go wrong for us, that we have problems and worries of our own. By letting our preschoolers see that we don’t have all the answers, we show them that we’re open to learning from them and reinforce our goal of growing and developing together as a family that respects each other. There’s an added bonus to talking with preschoolers honestly and genuinely: they will grow up knowing how to respectfully communicate with us. This leads to debates versus arguments as they age. Think about it. When we teach our kids to disagree respectfully with us and each other, they learn how to argue, support their argument, and become passionate without disrespectful screaming matches (or teenage tantrums down the road). Excerpted from Preschool Clues by Angela C. Santomero and Deborah Reber. Copyright © 2018 by Angela C. Santomero and Deborah Reber. Used by permission of the publisher. All rights reserved. 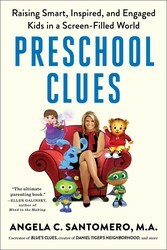 The award-winning creator of Blue’s Clues, Super Why!, and Daniel Tiger’s Neighborhood shares the secret sauce behind her shows’ powerful, transformative results in the form of eleven research-based, foundational “clues” to ensure that preschoolers flourish academically, socially, and emotionally during this critical time.The preschool years—when children are between the ages of two and five—are the most influential, important years in a child’s life. Studies show that pausing to interact, playing to solve problems, diffusing with humor, and using repetition are the hidden clues conscious parents use to raise successful kids and help them learn critical thinking skills, foster empathy, and nurture their sense of self-worth.